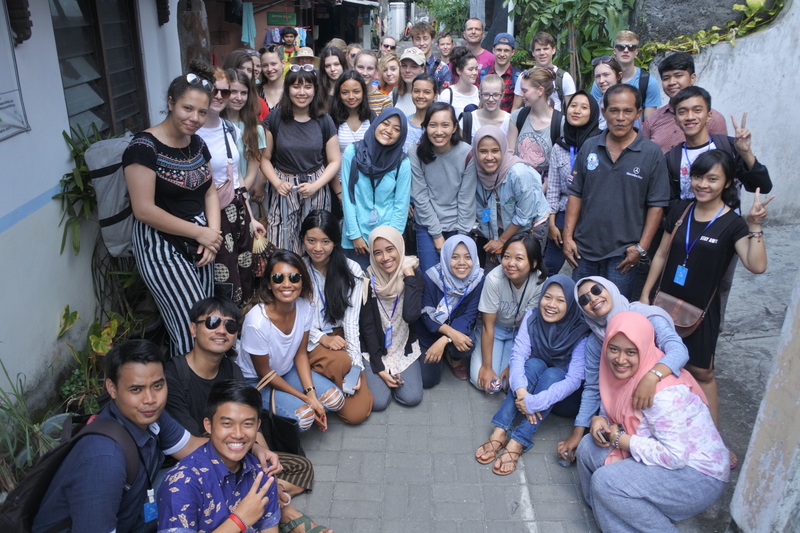 Project Child Indonesia was honored to host students and teachers from Haarlemmermeer Lyceum, Netherlands from Monday, April 30th to Tuesday, May 1st, 2018 in the riverside area of Code. There was a total of 27 students and 2 teachers joining the visit, and they stayed for a night in the local’s houses. Their coming to Indonesia is part of an exchange program with SMAN 9 Yogyakarta as the sister school. Upon their arrival in Code, they got a chance to learn Indonesian Language before heading to the local’s houses where they would be staying in. They enthusiastically learned basic Indonesian vocabularies to be able to communicate with the locals. They then were split into several groups to go on a tour around the area, guided by our volunteers. The spots visited were the riverbanks, the traditional costumes rental, Sekolah Sungai location, and the community leader’s house. After the trip, they gathered at SD Jetis 2 to play traditional games from Indonesia and Netherlands with our team members and some children from the neighborhood. We had so much fun playing Indonesian games Gobag Sodor and Tug of War (Tarik Tambang), as well as a Dutch game called Annemaria Koekoek. The highlight of the day was the Cultural Night. Our community in Code had prepared some performances on traditional dance and music. They gave their best in the performances, and we were really proud to see the children and community members including the parents and also the elderly perform with such enthusiasm. Afterwards, there was a fun dancing session led by the dancers, who spontaneously made dancing moves to some dangdut tunes. Everyone was having a great time dancing together, and our guests seemed to engage well with the locals during the event. On the following day, we painted some murals on the riverbanks in a collaboration with our friends from ISI Yogyakarta. Then we had a short walk along the riverbanks, before going back to the Community Centre for our closing ceremony. All in all, It was a great experience seeing youth from Netherlands mingle with our community in Code. Seeing the positive result and feedback, we hope that our partnership with Haarlemmermeer Lyceum will last in the upcoming years. Also, Project Child is open for any kind of collaboration with more individuals and institutions to help bring positive impact to the community. Do not hesitate to contact us for more information!